Like a Bat Out Of Hell, Meat Loaf burst onto the rock scene as far back as 1971 with a track called "What You See Is What You Get", a little known collaboration with Stoney Murphy. Fast forward to 1977 and Meat Loaf hooked up with Todd Rundgren and created the best-selling "Bat Out of Hell" album. Michael Lee Aday has never looked back and celebrates nearly 40 years in rock music this year with the Top 5 album, "Hang Cool Teddy Bear". 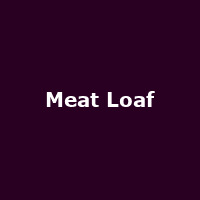 There were some strong rumours that this might be Meat Loaf's last studio album - but let's just wait and see. He managed to assign some pretty major names for this latest set including Steve Vai, Brian May and even Jack White on the song "Like a Rose". It remains to be seen whether any of these stars rock up to the plate for the Loaf's next tour, which just happens to be in the UK. The real Deadringer begins his winter concerts in Cardiff on 29th November and continues via Bournemouth, Birmingham, Wembley and more until Newcastle on 14th December - tickets go on sale this Friday at 9am, ranging from £25.50 to £48 depending on venue. Aug 2018:Special Offer: Bat Out Of Hell - The Musical - West End tickets available for 1/3 off!